In response to Richard Eisenbeis' excellent "The Five Anime of Fall 2013 You Should Be Watching", I've compiled my own listing of shows that my instincts are telling me are the contenders for the top spot. Out of the 49 anime that Mr. Eisenbeis has noted, I've only tackled about 14-15 of them, so I'm sure that he has a much wider view of the situation. So please, understand that, in no way, am I trying to degrade Mr. Eisenbeis' choices, I fully agree with his picks. You can think of this as a sort of "Opposing View" post. Non-Spoiler Plot Summary: Mr. Eisenbeis put this one best: "One day, a fleet of mysterious AI-controlled ships appeared in the Earth's oceans and drove mankind from the sea. Now, seven years later, a former naval cadet finds himself the captain of one of these mysterious ships and wages a one ship war against the others to retake the seas." Why You Should Watch It: Mr. Eisenbeis and I are in total agreement on this one. This is fun but reflective adventure series set in a sort of post-apocalyptic Earth in which all of our supply and communication lines have been destroyed. The situation in the show isn't portrayed as dire but it most certainly is not all roses either. Humanity is trying to fight a war that it can't win and the only hope is the crew of a defected Fog ship "I-401". In addition to the adventure, this series is chocked full of historical knowledge bonuses. If you know the history of Japan (specifically of the Japanese navy circa 1900-1920) then you realize that most of the ships in the show are homages and references to ships that really existed. I found this amazing when I first noticed it. I know a fair amount of Japanese naval history, so this felt great. Non-Spoiler Plot Summary: It was just a normal day in the online game Elder Tale when everything changed. After a game update, everyone logged into the game was seemingly pulled into the game and things have... changed. This day became known as the Apocalypse. Shiroe and his friends find themselves in a brand new world with no rules. Why You Should Watch It: We still have well over half of the series to go, so there is plenty of room to swing either way on the Good-Bad spectrum, but I do have a good feeling here. The protagonist, Shiroe, is a master planner in both tactics and overall grand strategy. Part of the fun here so far is trying to figure out what his plans are before they actually execute. His encyclopedic knowledge of the world of Elder Tale and the game mechanic monologues he goes on are fascinating. In addition, the complex socio-political world within the game is shaping up to be incredibly interesting. How Shiroe plans to work his way into this power structure, we don't know, but whatever it is, we know it will be a ridiculously well-planned way. Non-Spoiler Plot Summary: Mr. Eisenbeis again said this the best: "There are two towns that border the ocean: one above the waves and one below. As the population of the underwater town begins to wane, their middle school is forced to close—causing the four remaining sea-human students to attend school on dry land." Why You Should Watch It: Nagi no Asukara takes us on a journey into the minds of children on the cusp of adulthood. Their emotions and idealistic views of the world are taken on a ride as they emerge from the water to explore the land. The show also looks at how segregation and racism can affect these children and their development and why anger and suspicion shouldn't be the only answer. In essence, this is a show about children learning important lessons about the flaws of adulthood and how they should go about changing them. Non-Spoiler Plot Summary: Haruto is a high school student living in the neutral country of JIOR at the beginning of the first season. When JIOR is suddenly attacked by Dorssia and completely overwhelmed, Haruto finds himself compelled to enter a strange mecha that appeared on his school grounds. Driven by revenge, Haruto starts a quest to destroy the Dorssians and keep his friends safe. Along the way, mysteries unravel and the true nature of the Valvraves are revealed. Why You Should Watch It: Valvrave the Liberator is a giant mecha show made by Sunrise that takes a very different approach to giant mecha than their famous Gundam franchise. This show is baked with mystery at its core and it's all about revelations and discovery (and camp, don't forget the camp). The main characters are forced to come to terms with the implications of being able to pilot the Valvraves. In the process, the show sort of deconstructs the idea of child soldiers and shows us how piloting a giant mecha might not be awesome as we think. The second season is no different from the first. There is plenty of mystery still left to go (with only six episodes left!) and the plot continues to not disappoint. Valvrave has made a name for itself purely by giant "WHAM" episodes, those are also present in the second season. If they keep it up, this could be the best mecha show in a while. Non-Spoiler Plot Summary: Banri Tada is a new student at a law school in Tokyo. On his first day, he meets a new friend Mitsou and they become good friends during the day because of similar mannerisms. Eventually, they are confronted by Kouko, Mitsou's extremely controlling and slightly crazy childhood friend, whom Banri takes a liking to despite this. The series unfolds with a few reveals (one of which is about Banri, and it changes the whole dynamic of the show) and it shows itself to be a very mature take on the concept of the "friend zone" and how that kind of situation would play out. Why You Should Watch It: This show can be a bit crazy and I'm not entirely sure where it's going yet. At the same time, I have a gut instinct about this show, just like Log Horizon; I think that this show could be heading for a very mature look at relationships and how Banri can deal with the world he's in. I like Banri's character and his backstory (or lack thereof, you'll see). He comes off as the perfect fish-out-of-water character that just wants to be accepted as a friend in this new world. For all her quirks, Kouko isn't bad either. She's pretty crazy and all that, but she feels like the perfect character for a show like this. She's a sincere but confused character. Altogether, I think this series has the ammunition it needs to make it great. I probably like it a lot more than I should. If you want more suggestions on what to watch anime-wise, I invite you to look at my Anime Marathon 2013 series, where I've been reviewing anime that I've missed in my exile from anime since 2008. I've got a bunch of reviews done so far. 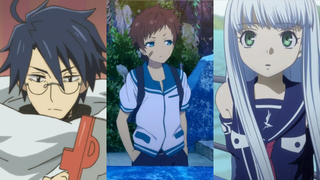 If you want a more professional opinion, I strongly recommend Richard Eisenbeis' "The Five Anime of Spring 2013 You Should Be Watching" and "The Five Anime of Summer 2013 You Should Be Watching" for ideas. Thanks for reading, I hope I didn't annoy too many people by leaving out Kill la Kill.